Hello crafters and Happy Saturday! 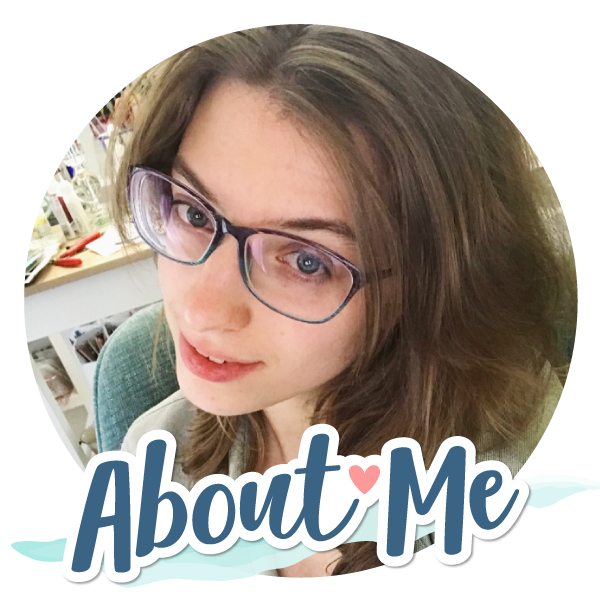 Today I am excited to be participating in a blog hop hosting by one of my dear friends Maria Sabina Riata, who blogs at Lollyrot Scrapbooking. Maria has come up with a special blog hop called Stamped Around the World and I think you are going to enjoy it! The purpose of the hop is to spread the joy of receiving a handmade card to people around the world. All of us girls participating in the hop each are to make a card write a message inside on a sticky note and then mail it to someone else! 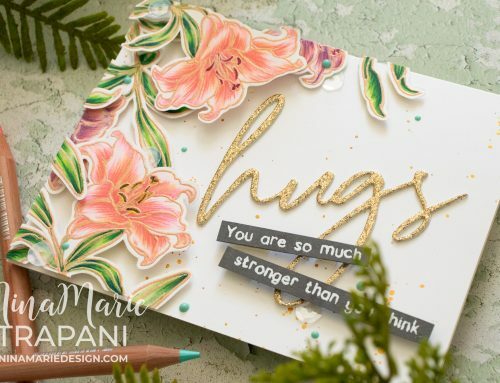 That person is to then write their own message on a sticky note and mail the card on to somebody they know… and the joy of cardmaking is continually passed on and on and on! Pretty cool, huh? 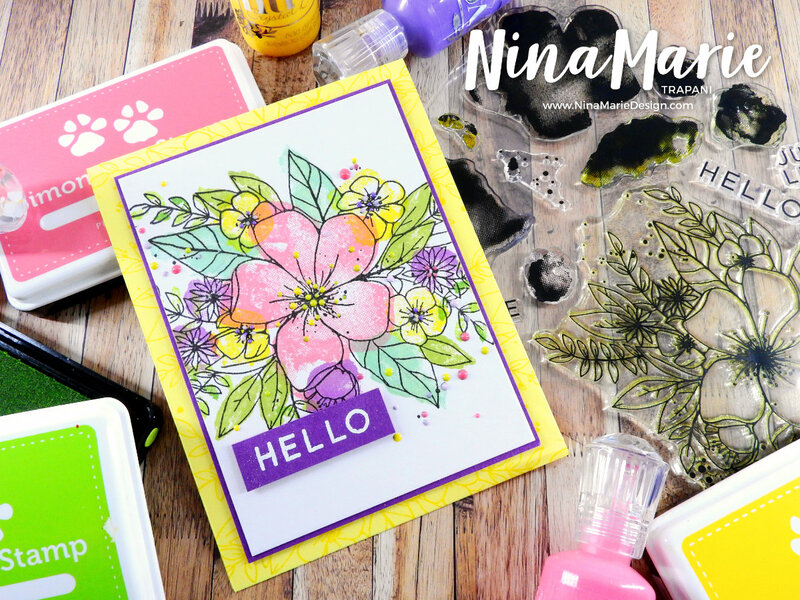 So for my card today, I am creating a pretty “hello” card using Concord & 9th’s Hello Lovely stamp set, along with products from Tonic Studios who is sponsoring the hop with a special giveaway. Details on the giveaway (plus a giveaway of my own!) are at the bottom of the post. 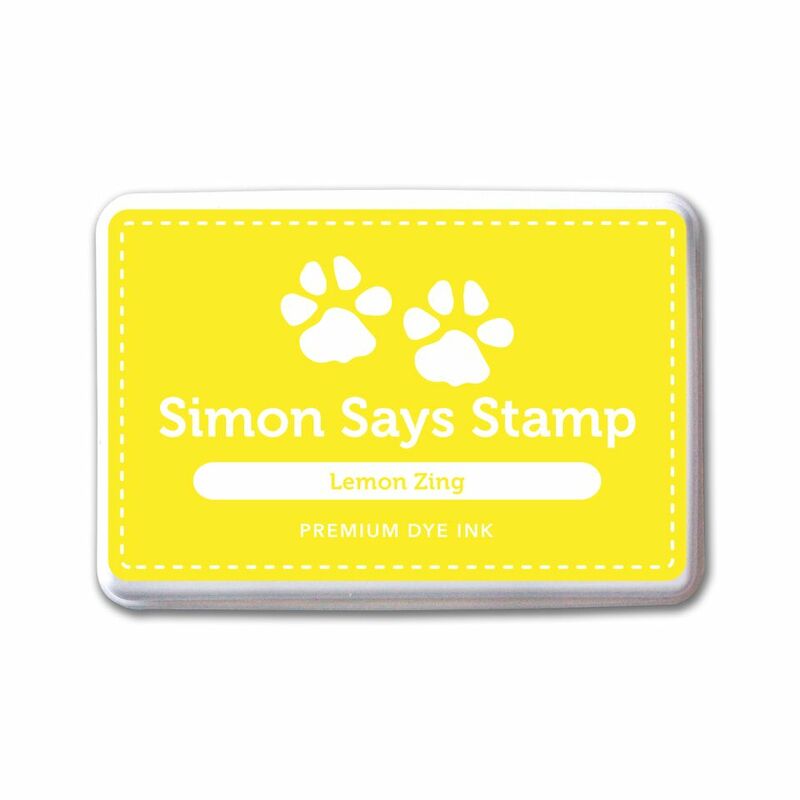 A popular trend right now in the crafting world is the use of halftone stamps. Halftones are images made up of a series of dots to simulate color, shading or gradients. 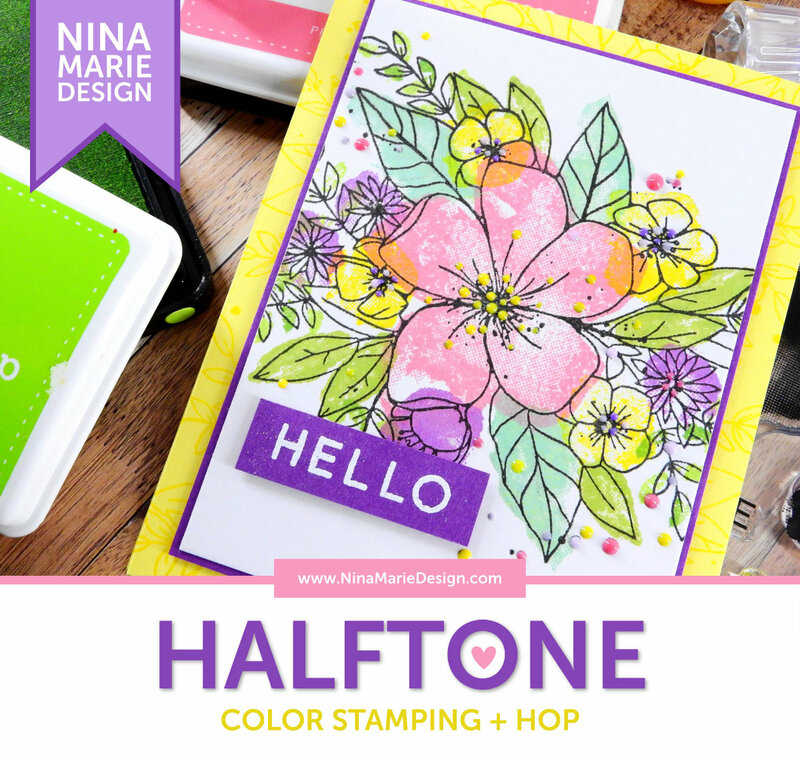 In the Hello Lovely stamp set, there are a few halftone stamp images that can be used to “color” in the floral outline stamp. This is so much fun, and super easy! I was aided in the creation process of this card by the use of the Tonic Studios and Tim Holtz Stamp Platform. This tool is much like the MISTI Stamping Tool which many of you are familiar with and love; I too am a huge fan of the MISTI. 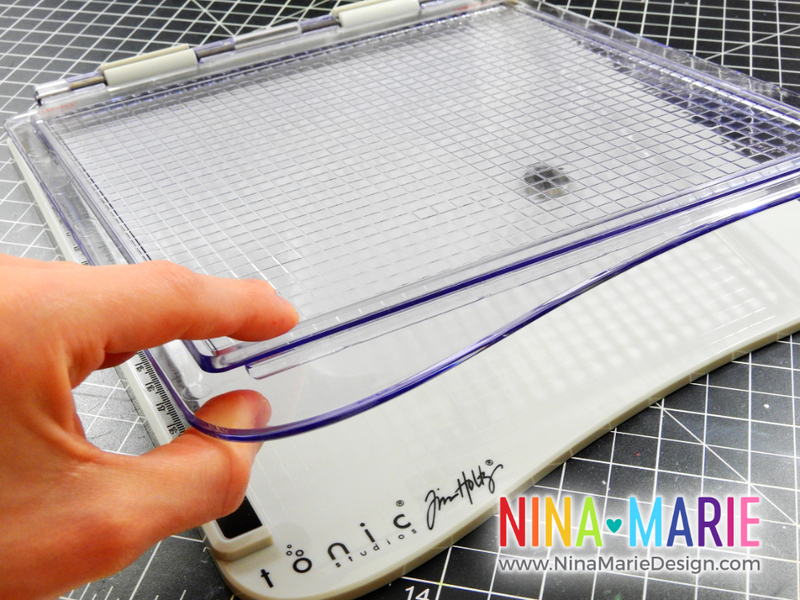 But the Stamp Platform is also just as great as the MISTI, and in the video below I touch quickly on the features of the Stamp Platform. Many of you have asked for a video talking about the Stamp Platform and MISTI tools, which I will be posting very soon. In that upcoming video, I will go more in depth on the Stamp Platform’s features and what I like about it. SHIPPING NOTE ON THE STAMP PLATFORM: The Stamp Platform from Tonic Studios and Tim Holtz is scheduled to be released and shipping sometime in early June. Due to some design adjustments and improvements, the original release and ship date set for May has been adjusted to June. 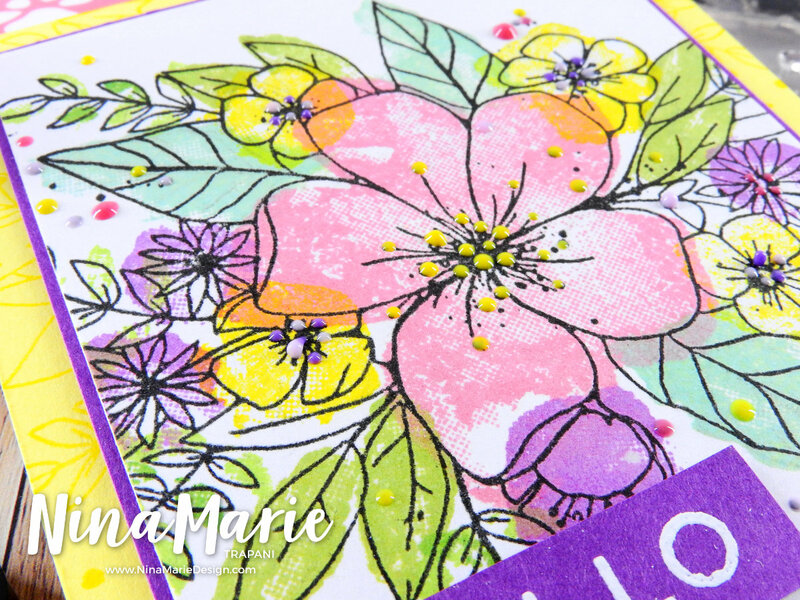 Embellishing this card was a lot of fun! 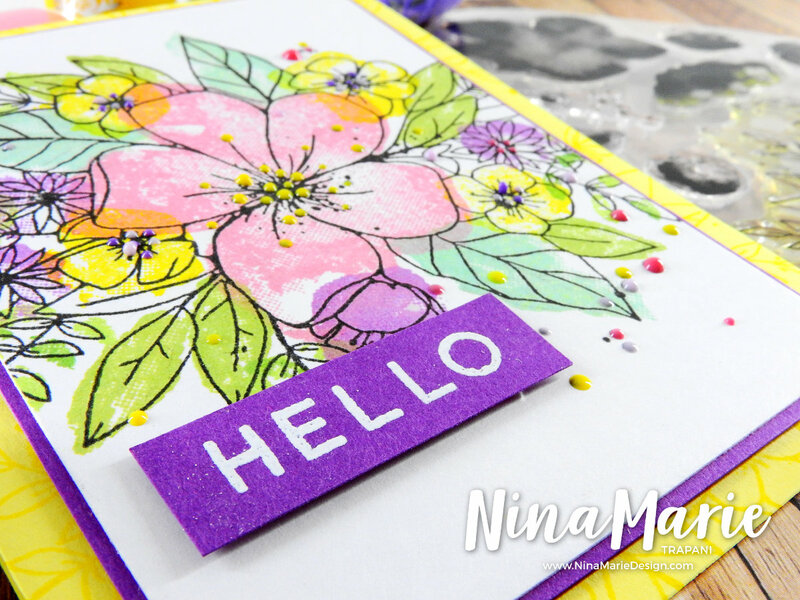 I used four different Nuvo Crystal Drop colors to cover over many of the black splatters, which are part of Concord & 9th Hello Lovely outline floral image. When selecting the Nuvo Drops, I was careful to select colors that matched my ink choices as close as possible. The resulting effect of the Nuvo Drops in place of the black splatters is quite colorful! I hope you will be checking out the video below to see how the card came together! Also make sure you keep reading to find out more details on the Stamped Around the World blog hop. Thanks for visiting me today! If you have already been hopping along with us, your next stop if none other than my sweethearted friend, Maria! However, if you are just joining in on this hop, I have the full list for you below! What is a blog hop without some fun giveaways?! As the sponsor of the hop, Tonic Studios is giving away a special surprise bundle of goodies to a lucky, random winner! Leave a comment on all the blogs in the hop to increase your chances of winning! The winner will be announced Maria’s Lollyrot Scrapbooking blog on May 27th. AND, as a fun twist to this hop, instead of me simply sending this card to someone I usually send a card to, I want to spread the cardmaking joy even further and send it to one of YOU, my fellow crafters! 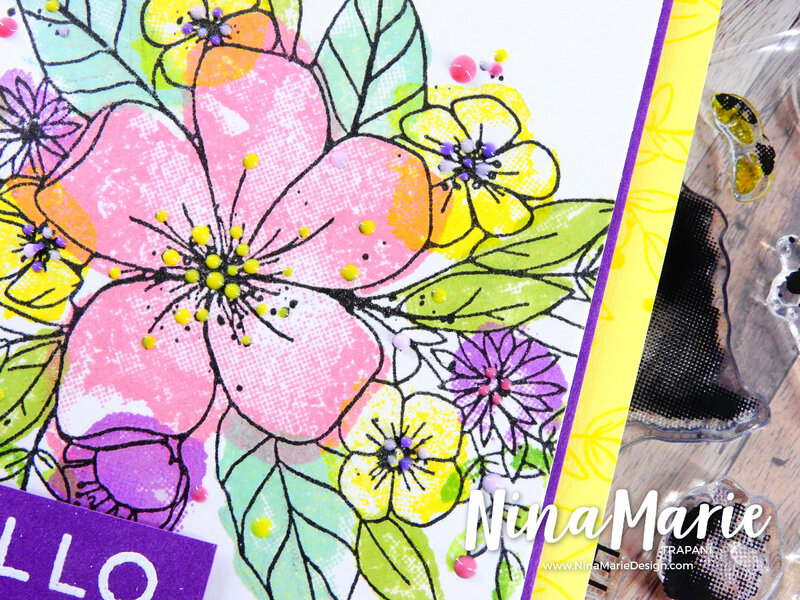 So make sure you leave a comment on my blog post here and I will randomly select a winner to send the card to… and then you can play along and send the card to someone YOU know! I will draw the winner on May 27th. This is an awesome idea so needed in today’s world!!!! Thanks so much for your beautiful work!! Your card is beautiful! I enjoy watching your videos and techniques. Thanks so much for sharing!! Love this stamp so much! Amazing card with it, so bright and happy! Oh my!!! Nina, as always your creations are breathless!!! I love so much your colouring! You’re very very inspirational for me!!! 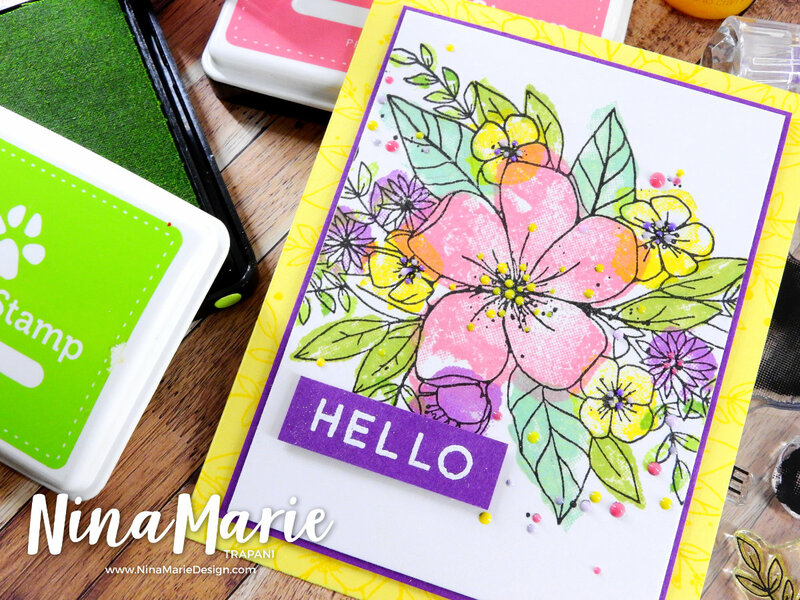 Just love the fun and bright colours you used on this card! 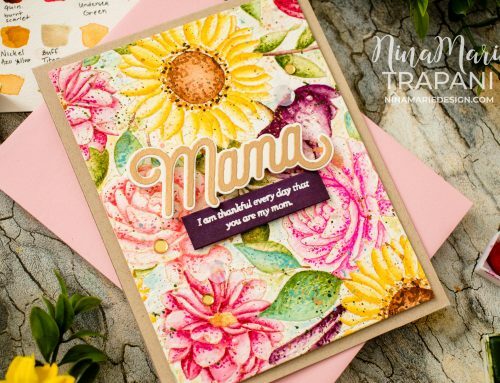 Such a sweet card, i love the colours you have chosen and the addition of the nuvo drops to give it real POP. Thank you for sharing inspiration. Wonderful ! So lucky to have such a talented friend like you ! You are amazing . Beautiful and bright card ! What a great idea to make a card fly all over the world ! Beautiful card. Anyone receiving such a card would have to smile when they opened it. Love the color combo you used. TFS! Great card, love your colors!!! Thanks for sharing!!! 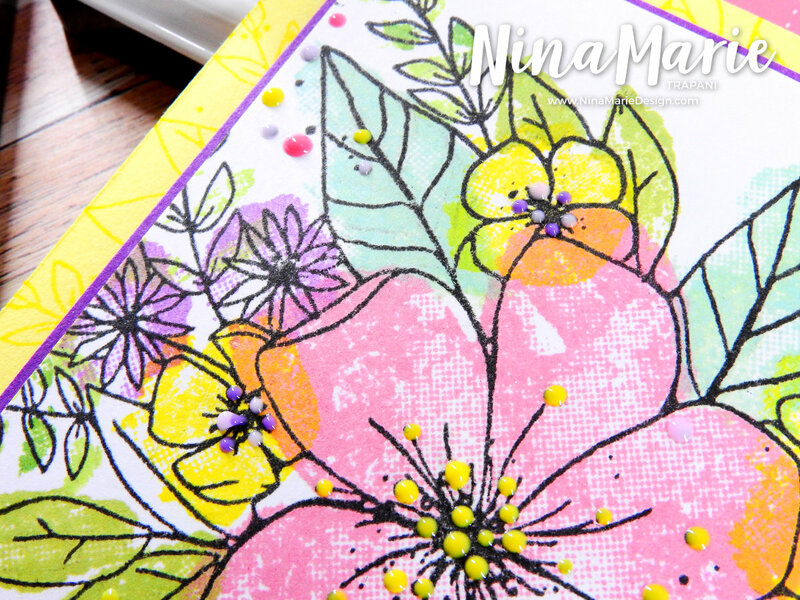 Beautiful card…wonderful tutorial on the halftone stamps/stamping! Thank you. I am beyond thrilled to see others now wanting to send someone a card in a way that the card can then be sent on to someone else, and so on. I have been doing this for years but never thought to write my note on a sticky note. I always used a pretty memo sheet or a beautiful die cut panel, etc. Another nice “extra” is to write on the back side of the card base the name of your home town, state (country). Then the next sender can do the same so all the recipients can see how far the card has traveled on its journey. A mention of this in your note is good, so that the next recipient will know to add their information. 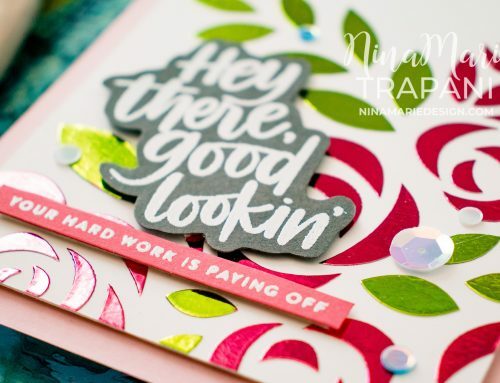 Gorgeous card, Nina! The colors that uou chose look amazing together. You really are talented, especially when it comes to design and color. I say that because I struggle with color sometimes. I’d be honored to win this card. Beautiful flowers! Thank you for the tutorial! 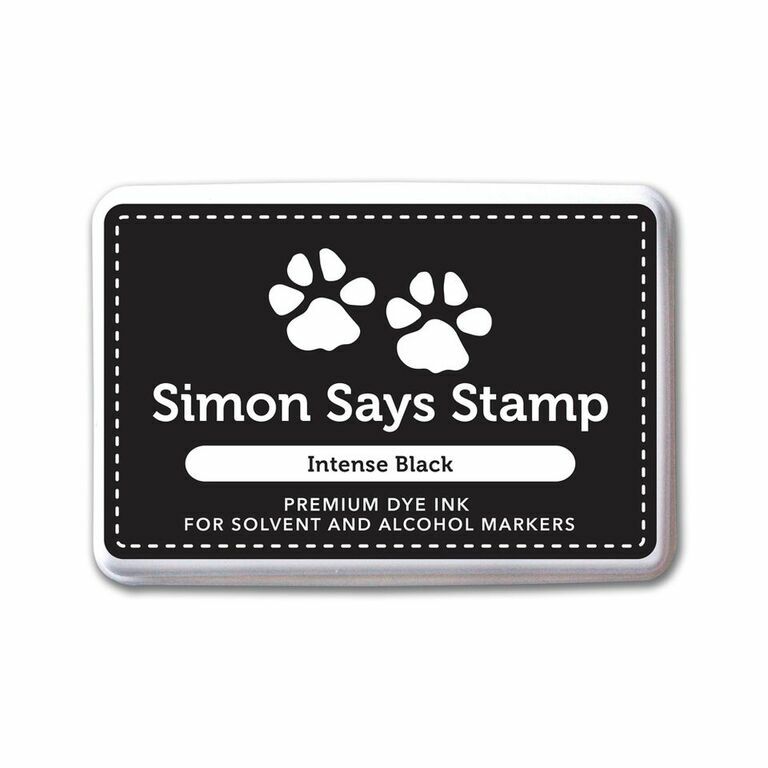 This is a lovely card. . .just love the idea of these halftone stamps. This video is a great way to see how they work! Thanks for sharing this. Such a beautiful card 😊Love these tutorials.